I want to reflect that double perspective in these four Wednesdays before Christmas – exploring themes in the Christmas story and applying them to us as we wait for Christ’s return. We’ll be simultaneously meditating on Christ’s first coming and second coming. Please do join me and link up your own Advent/Christmas posts below! 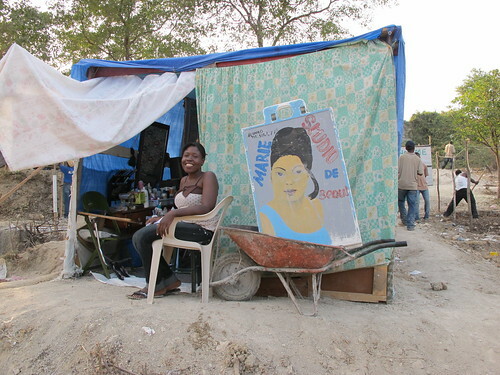 The Internet tells me that there are almost 400,000 Haitians still homeless after the 2010 earthquake. They are living out their days in hastily-erected camps, inhabiting flimsy tents. They have no home, no secure place. Others in this world drift though, forced out, displaced, with no piece of earth they can call their own, nowhere to stand and settle. Such was the case for God, when he dwelt on earth. The Son of Man had nowhere to lay his head. He identified with those who were poor and passing through. Even at his birth he was born in a manger, perhaps in a shed, perhaps outside, far from home. I picture the scene of people everywhere, crowds, dusty roads, donkeys, rolled-up make-shift bags. People travelling, jostling, talking, sharing food, grumbling at the unnecessary bureaucracy. I imagine Mary with the pressure of the double deadline – the deadline of needing to be in a different place for the census, and the impending deadline of her baby being born. I imagine Mary as she sat on the donkey, focusing on a fixed point ahead of her, the cramps increasing in intensity, trying to breathe through the pain. I think of Joseph’s anxiety as he pushed through the crowds, trying to negotiate with officials and friends. (I wonder why it was they had no relatives to offer them housing, in Joseph’s family’s home town. Had Joseph’s family disowned Mary, perhaps, for being pregnant? I don’t know.) I imagine Mary close to tears from pain and the not-knowing, the dismay at looking at the dirty animal trough, the acceptance that this would have to be it, the hoping and praying that it would be okay, that the baby would be okay. I think of Mary and I think of the world’s refugees. I imagine their longing to be at home, not to be in this in-between limbo. I imagine their desire for the long journey to be over, to be settled and relaxed. We too are refugees. We travel and pass through this world, but it is not our home (1 Pet 1). Even our bodies, they are not permanent, they are our temporary, make-shift accommodation (2 Cor 5). Sometimes it is not the pain of this world that most strikes us – more, the unsettledness of it all. We do not feel like we really belong. We feel that we were made for more than this 9-5 drudgery, the banal and the wearying chores. We were made for more than early mornings, family rows, traffic jams, paper-pushing, watching X Factor, eating takeaways. We sometimes long for brighter days, but we don’t know what they would look like. And here’s the truth: our spiritual ancestors were tentmakers, wanderers in wilderness; our saviour was a homeless drifter, born in an emergency shelter. And we too are drifting through this world, as refugees, strangers. We do not belong. We are not home yet. Emmanuel will come to thee, O Israel. Can you relate to feeling like you don’t belong in this world, the unsettledness of it all? “We sometimes long for brighter days, but we don’t know what they would look like.” This is really interesting, the thought that we don’t know what they would look like. On one hand, I resonate strongly with it. On the other hand, I somehow believe in my gut that I SHOULD know what they would look like. I wonder where that feeling comes from and if it’s justified or not… thanks for getting my thoughts rolling – again! Yes – I know what you mean on this! Would be interesting to hear what conclusions you come to… Much love and thanks for linking! I love the way you inhabit the minds of the biblical characters and bring them alive in your imagination. Reading scripture this way helps us to put ourselves in their shoes and gain a better understanding of how they felt and acted. Oh, thank you Joy! I’m so glad you connected with this, and as ever I am so encouraged by your words. Much love to you. This made me think deep and if I had to make a choice, I would rather be without anything in this world, but blessed with the joy of living in our Lord every day. Dear One, I cannot live without Him. Even the thought of that fills me with horror. Yes, we are pilgrims on our way home. Thank you for deep truths. Beautiful Mia – I do so love your heart for Jesus. That is the best that anyone can say of us, that we long for Him. “I wonder why it was they had no relatives to offer them housing, in Joseph’s family’s home town.” Actually, the greek word used for ‘inn’ is also used in Mark 14 to describe the upper room, and can mean a spare room in a house, not a hotel. And in the family homes, they kept the animals in the basement, hence the manger. So chances are, everyone was home for the census and there were no more bedrooms, so they were in the basement of the family home. Which means, she probably had aunts/mothers/cousins there to help with the birthing process and poor Joseph didn’t have to go it alone. Ah, interesting! Though that leaves me with further questions – if they were in a family home, with relatives, why make the woman giving birth go down to the basement, rather than the men? Why allow your relative’s baby to be laid in a manger, rather than bringing down a blanket or crib or something? I just did a post last night on Advent and how I never really knew exactly what it was. How funny! Looking forward to being a part of this link-up this month. How cool! I enjoyed your post – thanks for joining in! Yes Tanya, I have often found myself with strong feelings of not belonging here, of yearning for that perfect place with Christ. Especially when I first believed. I would spend hours and hours in the Word–get totally lost in It. My soul was so parched and I didn’t even know it. I had been fed lies most of my young life…and I knew that I had finally found Truth! Going ‘out there’ into the ‘world’ suddenly felt so alien—like a kind of culture shock. I noticed every detail of the wrong that people said and did, and I had a hard time reconciling it in my mind because I now knew how we were ‘meant’ to live. So here I am, years down the road, and I often find myself quite ‘comfortable’ again in my surroundings. Quite comfortable sometimes in all that ‘the world’ has to offer. And I have to remind myself that “this world is not my Home…I’m just a passin’ through”. Great new perspective on the advent season I had never considered before. Thanks, Tanya, and thanks for the Twitter invite to link up on Advent this month. I’m posting daily from our family’s advent activities, but I’ll also be including some poems for Advent Sundays. Thank you! I’m really enjoying thinking through Advent from a fresh angle- it was new to me too. I LOVED your poem – so beautiful. Thanks for linking up! Leave a Reply to Mark Allman Click here to cancel reply.